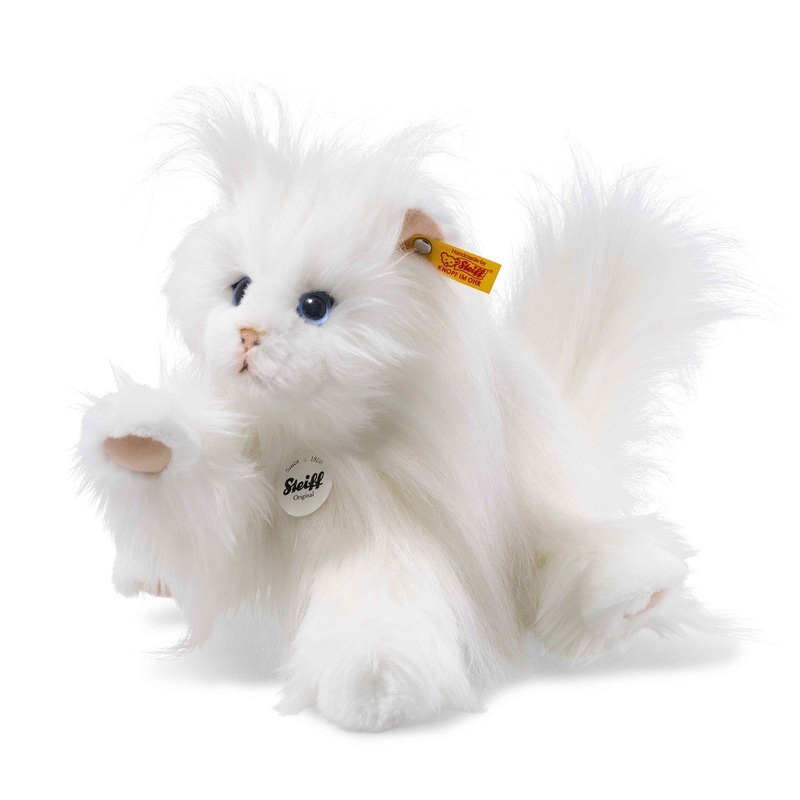 Steiff EAN 099243 Princess Persian Cat, 30cm. Steiff Princess is 30cm tall and made out of white plush. She is filled with synthetic filling material and has safety eyes. She has a bag with pellets in her belly. Princess has the CE mark for safe toys. Steiff Princess has a stainless steel button in her left left ear. Steiff EAN 099212 Pharao Cat, 42cm. Steiff Pharao is 42cm tall and made out of brown/creme plush. She is filled with synthetic filling material and has safety eyes. She has bags with granulat in her legs. Pharao has the CE mark for safe toys. Steiff Pharao has a stainless steel button in her left left ear. 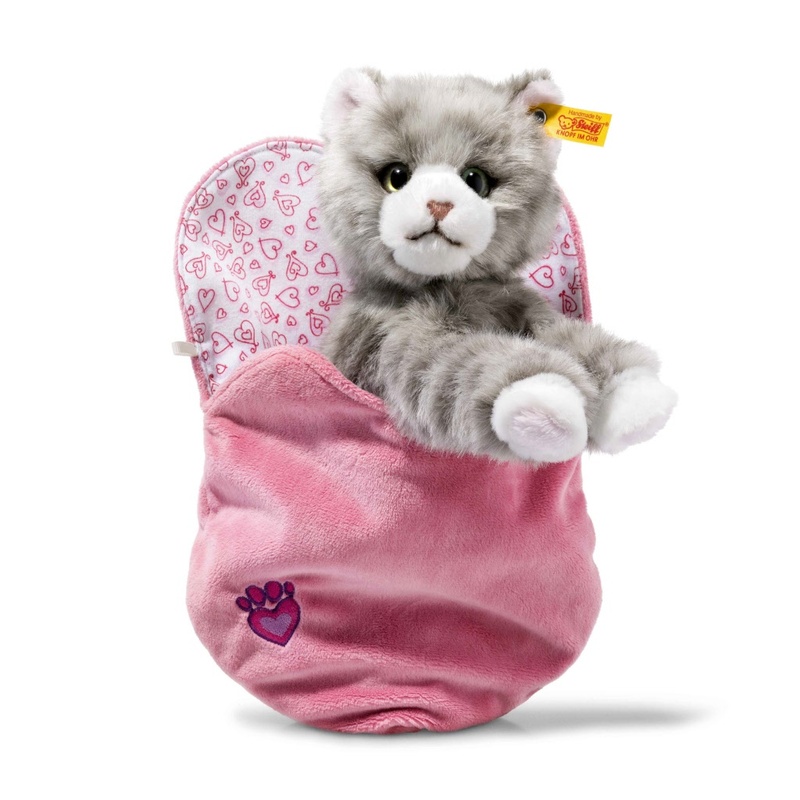 Steiff EAN 099311 Cindy Cat in Bag, 14cm. 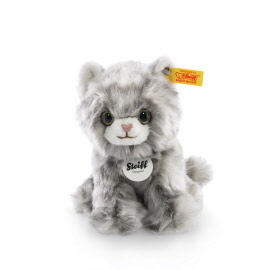 Cindy Cat is made out of soft grey plush. She is filled with synthetic filling material. Cindy has a plush nose and safety eyes. She comes with her soft pink plush bag. Cindy has a stainless steel button in her left ear. 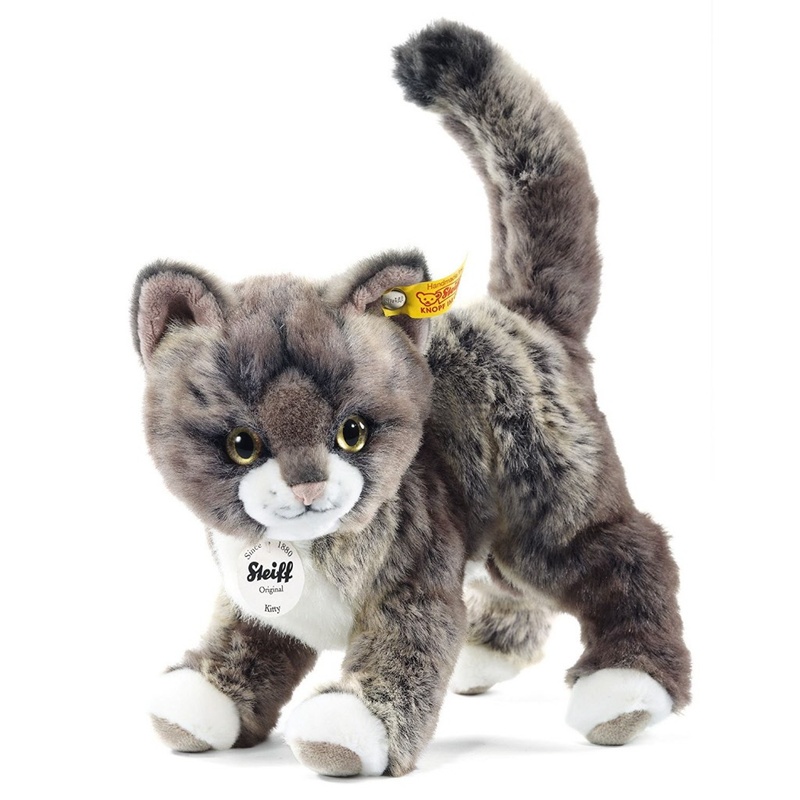 Steiff EAN 099663 Lucy Cat, 18cm. Lucy Cat is made out of soft cream/multicoloured plush. She is filled with synthetic filling material. Lucy has sweet pink nose and safety eyes. Lucy has a stainless steel button in her left ear. 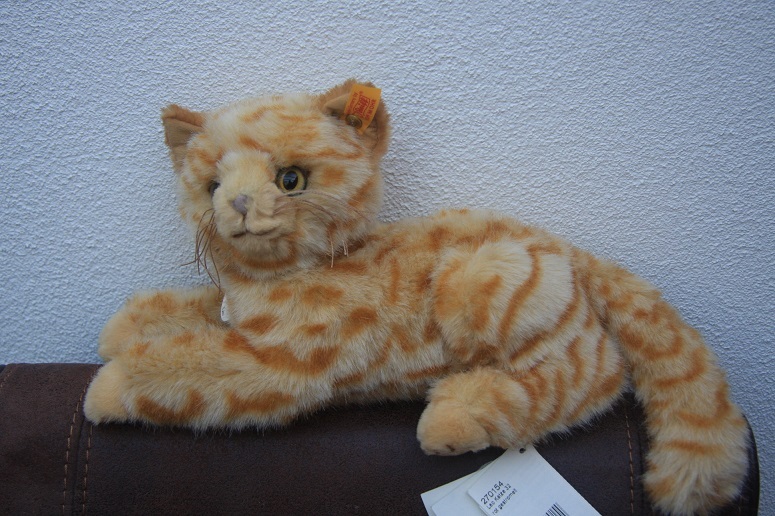 Steiff EAN 270154 Leo Cat 32cm. Leo is made out of orange coloured plush. He is filled with synthetic filling material. Leo has a brown embroidered nose and safety eyes. Steiff Leo has a gold plated button in his left ear. Steiff EAN 099342 Mizzy Cat, 25cm. Steiff Mizzy is 25 tall and made out of red/creme plush. She has safety eyes and is stuffed with synthetic material. Steiff Mizzy has a gold plated button in her left ear. 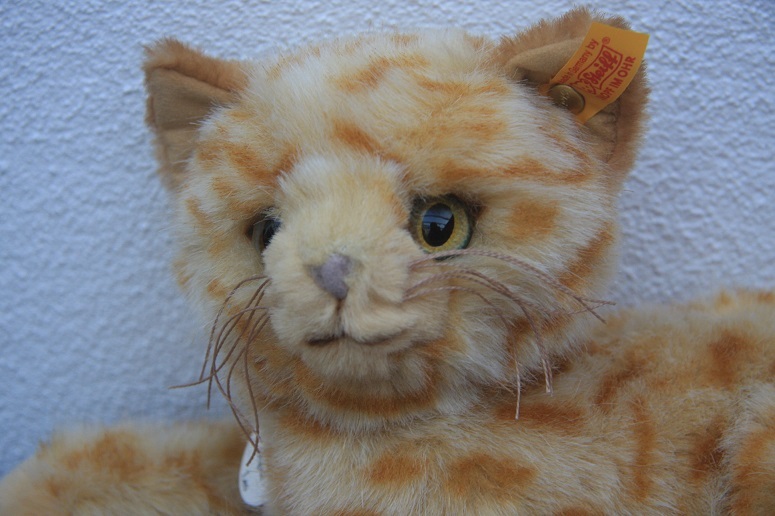 Steiff EAN 035852 Norry Norwegische Waltkatze, 45cm. Norry is made out of black/white plush. She has safety eyes and is stuffed with synthetic material. Steiff Norry has a gold plated button in her left ear. 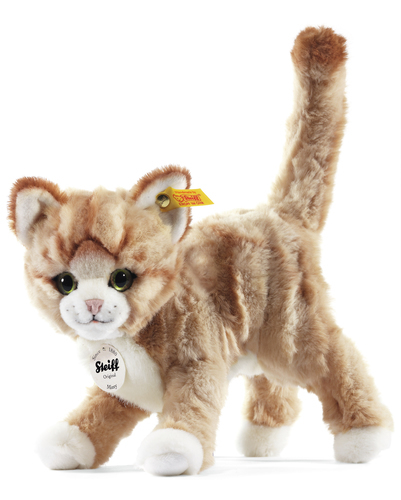 Steiff EAN 084027 Lizzy Kitten red tabby, 17cm. 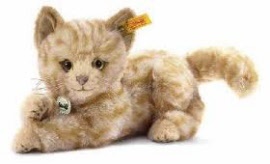 Steiff Lizzy Kitten is made out of red tabby plush. Steiff Lizzy has a pink nose and safety eyes. This cat is machine washable at 30° C.
Steiff Lizzy has a button in her left ear. Steiff EAN 084010 Minka Kitten grey tabby, 17cm. 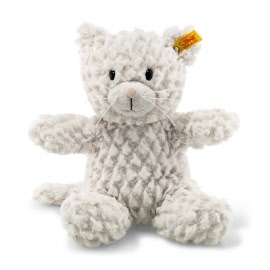 Steiff Minka Kitten is made out of grey tabby plush. Steiff Minka has a pink nose and safety eyes. Steiff Minka has a button in her left ear. Paws is sitting and is stuffed with synthetic filling material. 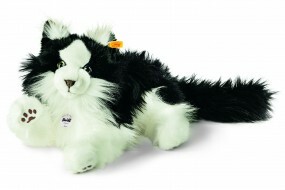 He has safety eyes and is machine washable at 30° C.
Steiff EAN 099335 Kitty cat, 25cm. Steiff Kitty Cat is made out of grey tabby plush. Steiff Kitty has a pink pluche nose and safety eyes. She has the CE mark for safe toys. 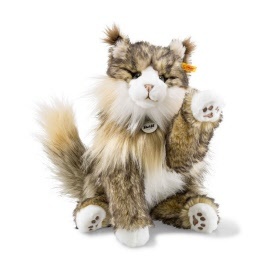 Steiff Kitty has a button in her left ear. Steiff EAN 099281 Whiskers Cat Soft Cuddly Friends, 28cm. Whiskers cat gives warmth and comfort. It's a wonderful present on many occasions. 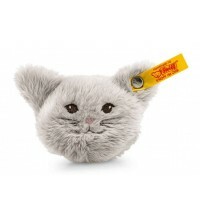 It is made out of soft light grey plush and stuffed with synthetic filling material. 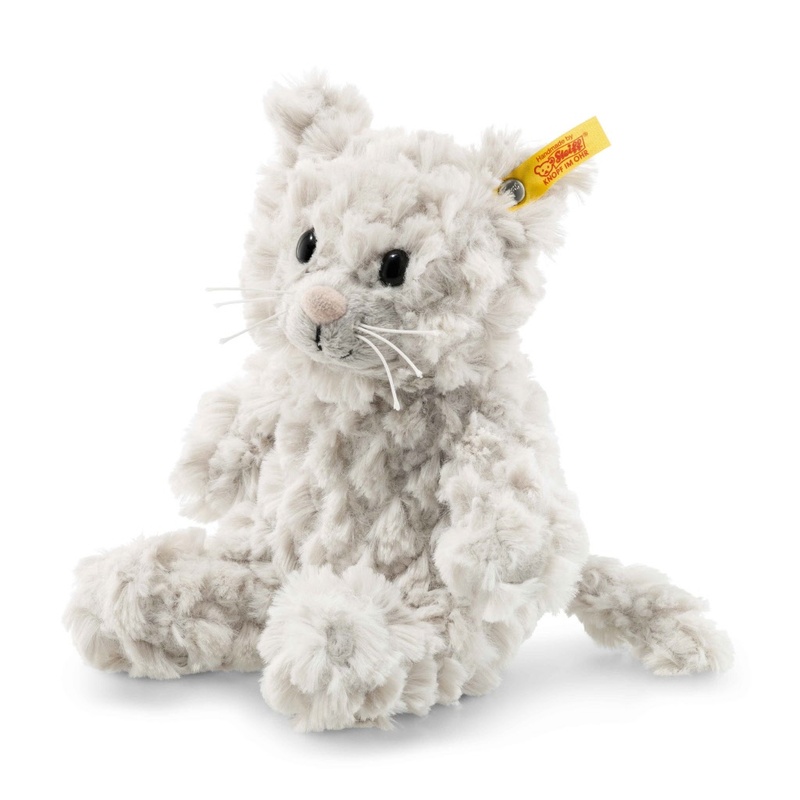 It has safety eyes and is machine washable at 30° C. It is with CE mark and stainless steel "Button in Ear"
Steiff EAN 099274 Whiskers Cat Soft Cuddly Friends, 18cm. 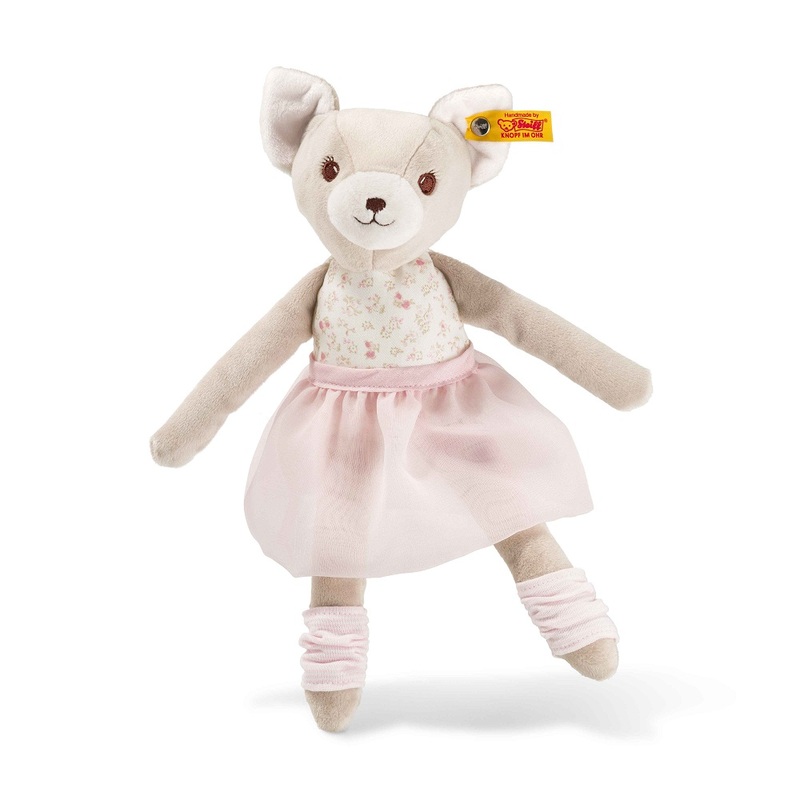 Steiff EAN 99267 Bella Ballerina Cat, 29cm. 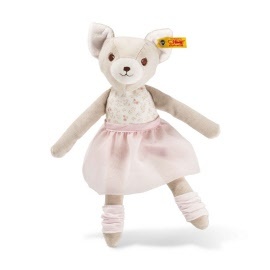 Steiff Bella Ballerina Cat is made out of beige/white soft plush. The skirt can be taken off. She is filled with synthetic filling material and has embroidered eyes. She has a stainless steel button in her left ear. Steiff EAN 099328 Big Head Carmen Cat, 20cm. Big Head Carmen Cat is made out of red/white striped woven fur. She is filled with synthetic filling material, airbrush details and safety eyes. She is machine washable at 30° C (in a laundry bag/net) and has the CE mark for safe toys. Steiff Carmen has stainless steel button in her left ear.